Well, the weather is still chilly chillier than ever but take heart! It’s no longer dark at 5pm and some sunny days of late have given us a taste of what’s to come. Spring and summer events are booking up and it seems like everyone is starting to emerge with an idea of what they’re going to work towards this coming season in multisport. So the coaching team at LFTC are working around a plan to help get you fit, strong and fast for the season and are brimming with ideas and enthusiasm to bring to your coached sessions. *now sold out – a small amount of spaces reserved for LFTC members – get in touch! You could do all these races, but we certainly don’t expect you to enter them all! For a start, they’re all different formats, and you might also have other races you really wanted to do, maybe you wanted to enter age-group qualification races or scoop up lots of London League points, or maybe you have other things happening in your life this year! If you were to enter them all, it would be unrealistic to put in your absolute top performance at all of them, so you might want to pick one or two races (ideally a few months apart, or if you’re more experienced within a couple of weeks of each other), to allow yourself to gradually build your fitness towards each race. As amateur athletes (no matter how ‘pro’ you look in your race kit or how much training you put in, I think pretty much everyone in the club is an amateur – sorry! ), it’s pretty unrealistic for us be at our best for more than a week or so at a time, so this is why it’s good to think about which race(s) will be your priority, or ‘A’ races, and which ones are more for fun/training/practising race skills. You might pick a race that isn’t on this list as your A race and use some of the Club Championships as ‘fun’ races – that’s okay too. 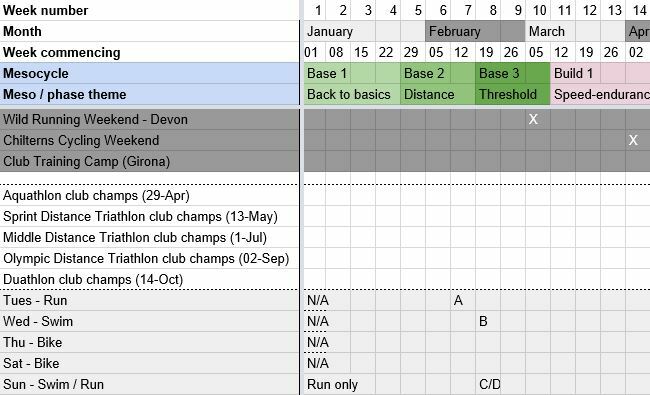 For each of the club championship races, our session plans will incorporate a few sessions that allow you to ‘peak’ ahead of the races – this means some hard fast sessions and a bit less volume the week (or so – for middle distance) beforehand. But as we know not everyone will peak for every race, we’ll aim to accommodate people who are continuing the build cycle alongside those who are ‘peaking’. If you have another race coming up that isn’t on this list, tell the coach at your regular sessions beforehand and they may be able to help adapt the session for you – whether this means increasing intensity for you and/or reducing volume right before/after the event. We will do our best to make sessions work for you – we just need you to communicate with us. At the start of the year we focus on what triathlon is all about – the business of endurance. The first 10 weeks are base training building aerobic endurance (which started in the last couple of months of 2017), continuing to incorporate focus on technique and improving aerobic threshold. Then once we’re into March and the first races are not too far off we begin our first 4-week build cycle where we start to focus more on finding and maintaining speed. You might have been to a good few of these sessions already, how are we doing? You can always feedback to your coach or ask questions directly, or if you like, email us on coach@lftri.co.uk. We’ll give you a heads-up as we move through each quarter of the year so you know what’s in store, so stay tuned and we’ll see you at training!